2018 has been a wonderful year of connecting patients to nature in the Horticultural Therapy Program here at Magee. 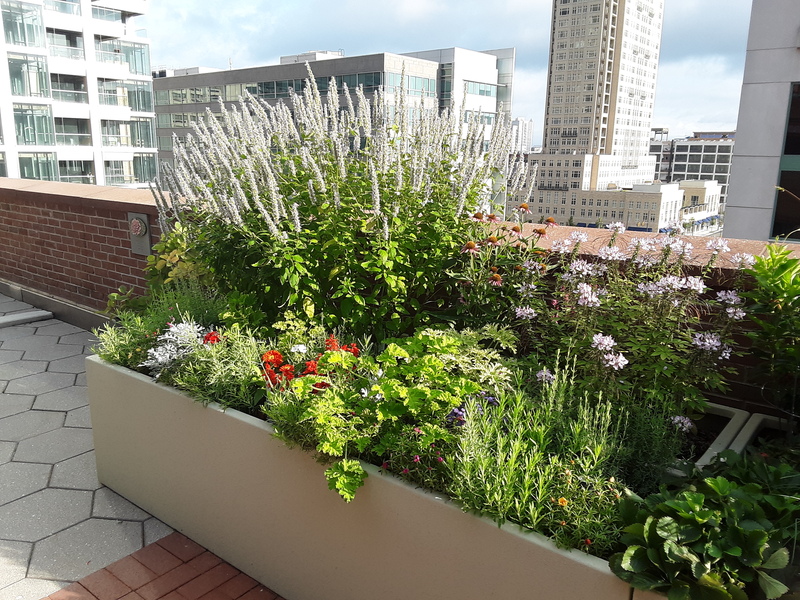 It is amazing to think that this program had approximately 1,400 patients gardening at the hospital and 75 outpatients digging in the dirt or making something with nature this past year. Even if they were just doing something simple as sensory exploration with horticultural oils or a scavenger hunt in the greenhouse or digging in the raised beds, they were surrounded by colors, textures, scents and sometimes butterflies and bees. As these photos show, garden and nature projects change with the seasons. Early 2018 was a time for planning the gardens, repotting plants that have outgrown their pots, ordering supplies for the upcoming year, spa activities and starting seeds. As the winter started to end to emerge into spring, there was a flurry of activity of seedlings being transplanted outside, flowers processed for patient rooms for Mother’s Day, garden stones to be made and outside beds were planted with herbs, flowers and vegetables. In June, the first cool veggies were harvested and used in the occupational therapy kitchens for food preparation by patients. The summer months saw patients making herbal oils and vinegar with harvested herbs. Summer tomatoes, squash, string beans and cucumbers were harvested. Succulent dish gardens were made to withstand the heat. Silk creations were put together for a nice inside activity in the air conditioning. 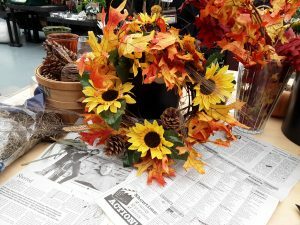 Now in the last month of fall, patients have used dried fruits, harvest containers and baskets, colored leaves, dried seed pods, wheat and cattails to decorate their seasonal mum plants or houseplants. Both silk and fresh flowers in fall colors of reds, oranges and yellows have been put together by patients in various ways. The Horticultural Therapy program not only has brought a creative venue for a patient to make something and care for something, but the greenhouse offers a place of relaxation to reduce stress and offer an environment that is calming and medicinal in a non-threatening way. Families have gathered here together to play a game or talk or just have fun together! 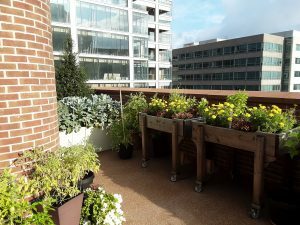 Some patients have been inspired to even join a garden club or participate in their own community garden when they were discharged. The Horticultural Therapy program has done outreach in the community by participating in the 2018 Philadelphia Flower Show with Radnor Middle School students. Seed and sprout planting was done with the Stroke Support Group members in April. Comcast employees helped in the Horticultural Therapy gardens in April. 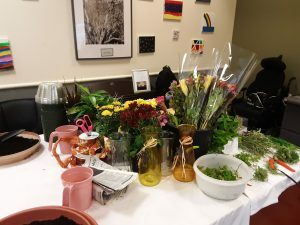 The Horticultural Therapy program has provided plants and flowers for events throughout the year like patients’ birthdays, anniversaries, graduations and other services. Visitors from Christopher Reeve Foundation, Haddonfield Garden Club, Bryn Mawr Rehab, Philadelphia Garden Club of America, Shipley School, Radnor Middle School and Philadelphia Food Trust have toured the greenhouse and outside gardens. The rest of this year will be putting the outside gardens to their final winter rest, taking care of the plants brought inside from the chill, decorating for the holiday season, engaging patients in holiday projects using live mixed greens, pine cones and berries to give to others or for their own enjoyment. The Horticultural therapy program wishes everyone a lovely holiday season and appreciates everyone’s support who believes in the healing power of nature. To learn more about Horticultural Therapy at Magee, click here.